Any disc brake rotor that exhibits thickness variation exceeding the maximum acceptable level must be refinished or replaced. Thickness variation exceeding the maximum acceptable level can cause brake pulsation. Using a micrometer (1) calibrated in thousandths-of-a-millimeter, or ten-thousandths-of-an-inch, measure and record the thickness of the brake rotor at 4 or more points, evenly spaced around the brake rotor. 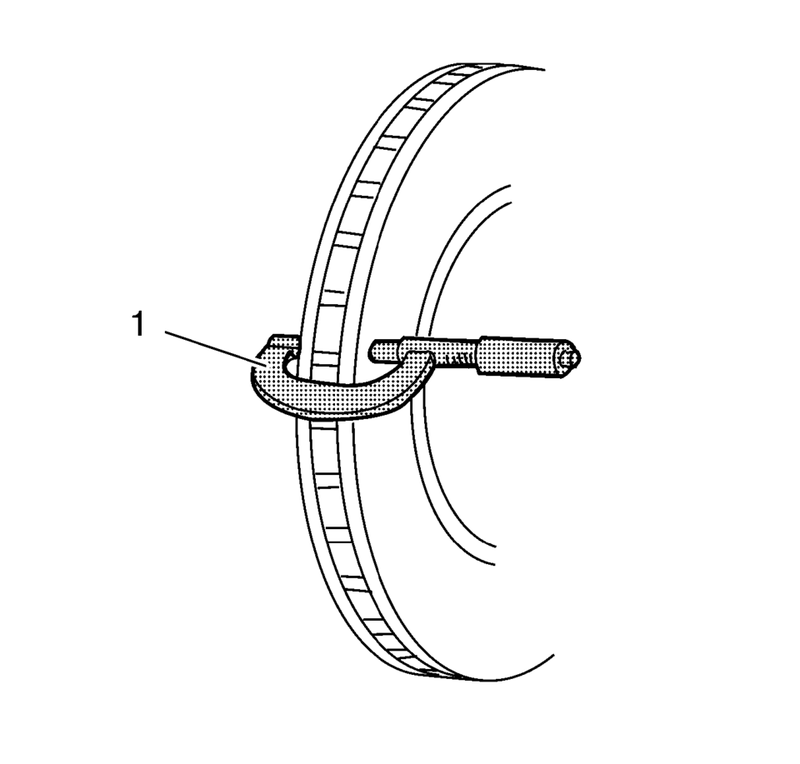 Make sure that the measurements are only taken within the friction surfaces and that the micrometer is positioned the same distance from the outer edge of the brake rotor, about 13 mm (1/2 in), for each measurement. Calculate the difference between the highest and lowest thickness measurements recorded to obtain the amount of thickness variation. Whenever a brake rotor is refinished or replaced, the assembled lateral runout (LRO) of the brake rotor must be measured to make sure optimum performance of the disc brakes. If the brake rotor thickness variation measurement exceeds the specification, the brake rotor requires refinishing or replacement.